Well, wonder no longer because here it is. A mass collection(let's say about 150000) of these phenomenal pulchritude constructions of pixels per day will fill the hearts any recipient with the love and gratitude from fans. ....OK that's enough, those roses are nice but the real reason for this campaign is obvious. Raina and San E has been nominated for Best Collaboration and Song of the Year and believe it or not, WE DO have a chance of helping them win. 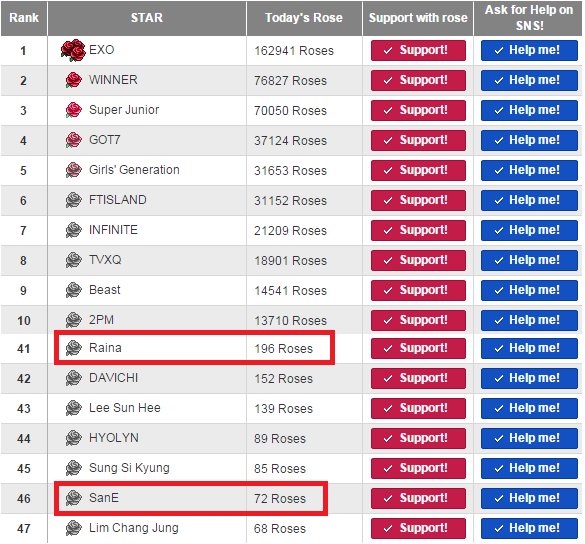 From my calculations and seeing how on one of the days EXO gain about 150000 roses we need about 7500 fans to match that. Do we have 7500 fans within this fandom....HELL YES!!!! THIS FANDOM LET RAINA DOWN FOR A MIDSUMMER NIGHTS SWEETNESS, THIS FANDOM LET RAINA DOWN FOR HER REST PROMOTION. IN THOSE PROMOTIONS RAINA REPRESENTS AFTER SCHOOL, SO NOT ONLY IS THIS FANDOM LETTING RAINA DOWN, THIS FANDOM IS LETTING AFTER SCHOOL DOWN. How about this fandom finally get it's act together and do something right for After School. HELP RAINA WIN!!! @Playgirlz Voter uses, I'll release the update for the Playgirlz Voter to allow it to perform MAMA votes shortly After posting this. 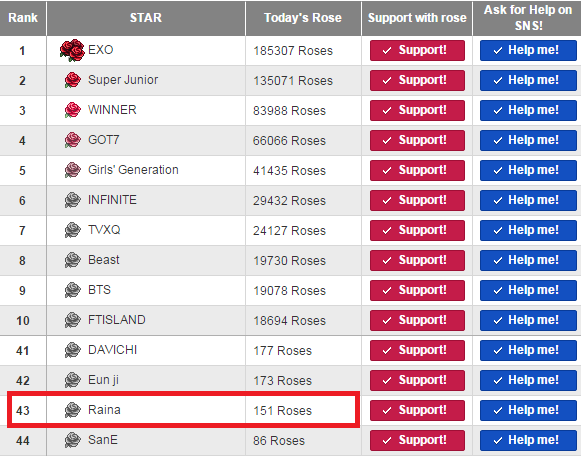 @ASDaze, I can understand how busy you guys are but this is very important both for After School and Raina. If you can help promote this campaign please do. We do have the numbers in this fandom to help Raina and After School win and we always had. What we never had is a fandom that'll put in the effort to make it happen...and this needs to stop. @Playgirlz Voter critics, the Playgirlz Voter doesn't hack the MAMA poll to gain an unfair advantage. If follows the MAMA rules but just automates the voting process. 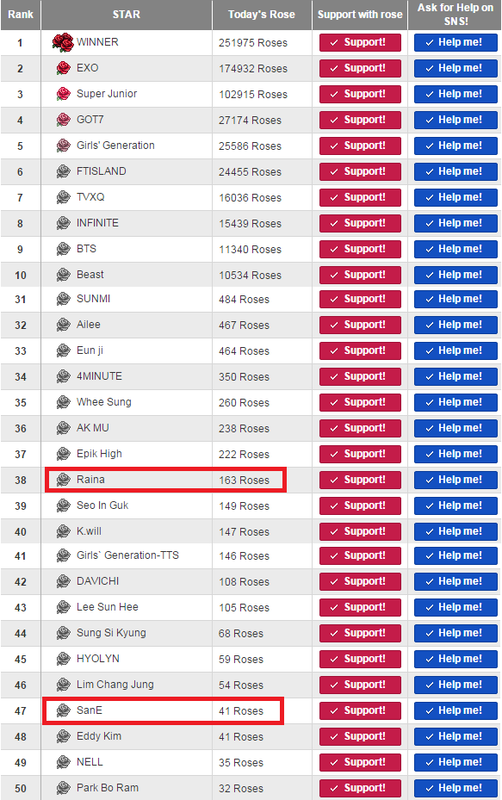 This allow fans that don't have the time but want to support Raina, participate. Now's not the time to get into fandom politics, I don't have time to deal with you guys, manually vote it you have to but just get it done. I've released Playgirlz Voter 1.9.0(i.e. the version containing the MAMA voting feature) at http://afterschooldaze.forumotion.com/t407-info-playgirlz-voter-automated-after-school-voting-and-support-system#3662 because I am having trouble releasing it as automatic update. The MAMA voting page is broken and sometimes(depending on what category you've clicked on) it takes a very long time to load. When I manually vote using Chrome and Firefox sometimes it crashes my browser. I don't think it'll crash firefox when the Playgirlz Voter is doing the voting but sometimes it might hang for a while and take 3 to 4 minutes to complete 1 vote. If it doesn't complete one vote with 5 minutes the Playgirlz Voter will stop that vote and retry again. Normally it should only take about a minute to complete a vote. Note: in my explanations I use the terms "MAMA poll" and "MAMA roses poll". 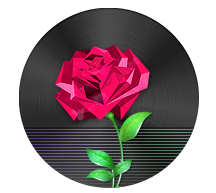 "MAMA poll" is for voting for award recipients and the "MAMA roses poll" is for giving your rose(that you receive after voting on the MAMA poll) to an artist. Voting on the 2014 MAMA poll happens between 12:00 am to 11:59 pm KST but the MAMA roses poll is between 10:00 am to 9:59 am KST. The winner of the roses poll will be featured on the banner at http://mama.interest.me/2014mama/vote after 24 hours. If a MWave account is used for the first time to vote on the MAMA poll, it'll only receive 1 rose to for the MAMA roses poll. 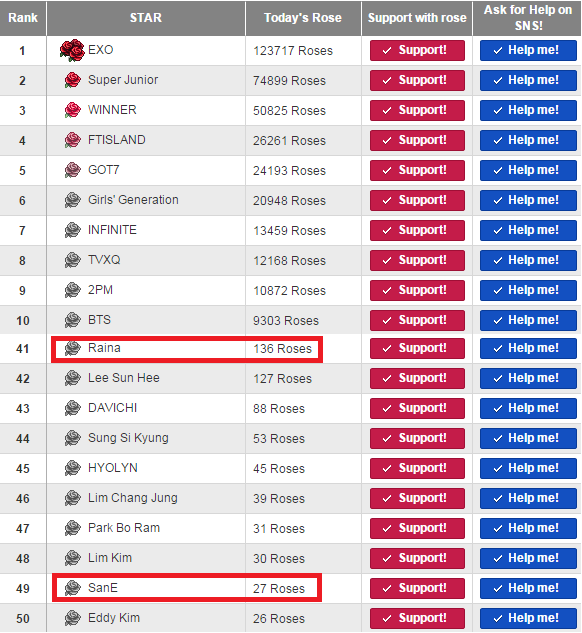 If a MWave account is used to vote every day after the first day it will receive 2 roses after every MAMA poll vote. EDIT: I've made some mistakes in my calculation(...haha this is very embarrassing for a Computer Scientist graduate)...I was in a hurry to get it done to try can get fans help vote...sorry . Upper bound numbers should be calculated based on each fans only having access to one IP address, voting once and only giving one rose to their idol on the day. Lower bound numbers should be calculated based on each fan having access to one IP address voting a maximum of 10 times and giving maximum of 20 roses to their idol on the day...in some of my calculation I've neglected to consider some of those factor...so I've just updated the stats. Also since I'm the Playgirlz Voter's admin I know the exact values from the Playgirlz Voter because it does track some voting stats. We need 9266 fans using the Playgirlz Voter every day to match EXO in terms of daily votes...do we have 9266 fans within this fandom. But to help Raina win awards you need to keep in mind that the MAMA poll started on Oct/27 and for the last 4 days Raina and San E don't have anywhere near the amount of votes EXO has. Lets go look for 9257 more fans to help use the Playgirlz Votes first and show the other fandom what we're capable of. We'll need more fans than that to make up for the last 4 days but first things first. Also not that I rounded up all decimal places to the near integer. Note: "Max MAMA Poll Votes" and "Max Number of Fans Voting" is only really accurate during the first day of the MAMA poll where every fan can only give 1 rose to their idols...or there is an incredibly larger number of new voters. "Min MAMA Poll Votes" and "Min Number of Fans Voting" are more accurate. 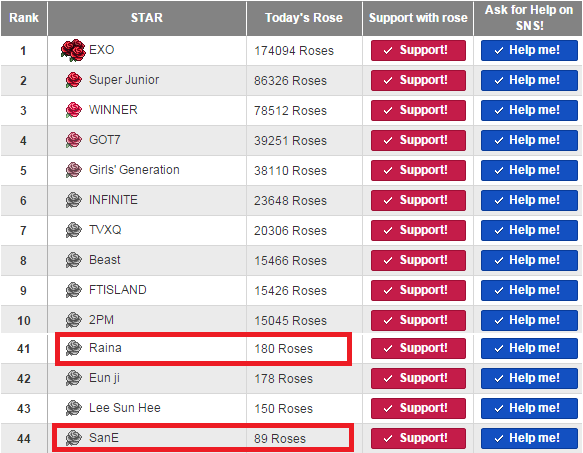 The MAMA roses poll gives a very good indication on how Raina and San E is doing in the MAMA poll as well. Today Raina received 151 roses, 115 of those roses are from Playgirlz Voter users voting on the MAMA poll 80 times, which means that 18 to 36 MAMA votes contributed to remaining 36 roses. 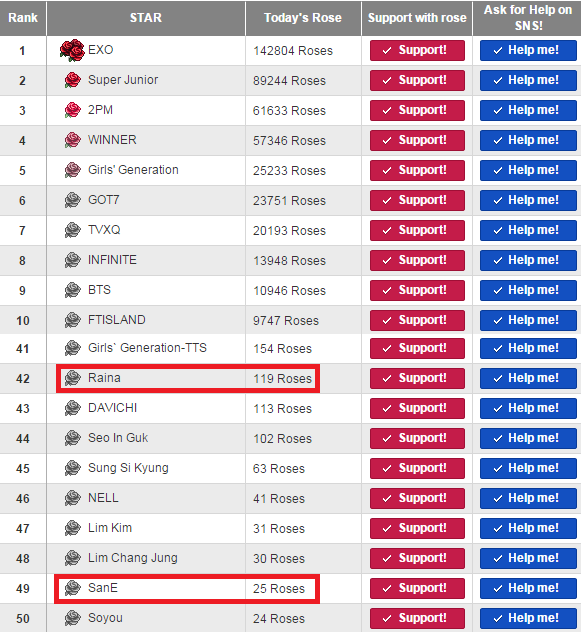 That means 98 to 116 votes were from After School/Raina fans( i.e assuming that every rose given to Raina is attained from voting for Raina and San E on the MAMA poll). 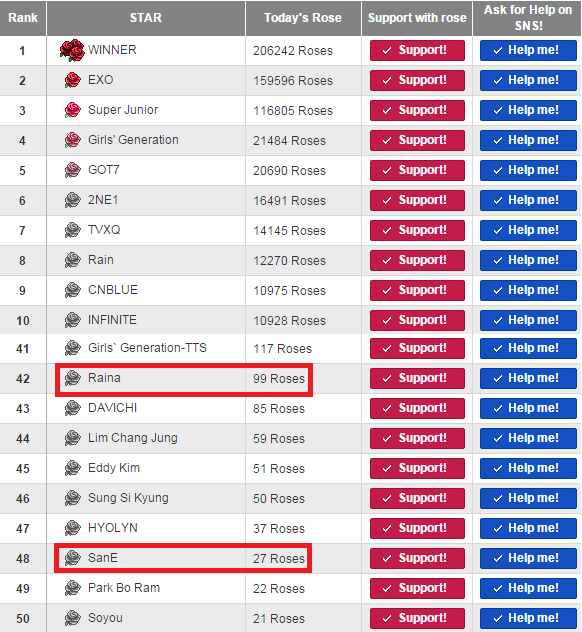 San E received 86 roses so assuming that every rose given to San E is attained from San E fans voting for Raina and San E on the MAMA poll then San E fans would have contributed 5 to 86 votes for the MAMA poll. In total Raina and San E has received 103 to 202 votes. To figure out how many fans contributed to the votes you need to keep in mind that Mwave allows a maximum of 10 votes per IP address and these calculated will be based on the assumption that each fan only has access to 1 IP address(i.e. local network). I know for fact that 5 playgirlz Voter users contributed to 80 MAMA poll votes(some of you guys voter on both Oct/1 and and Oct/2 during the MAMA roses poll's voting day and for those who don't know the Playgirlz Voter votes 10 times per user per day), the remaining 36 roses for Raina is from 2 to 36 After School/Raina fans which means today Raina only has 7 to 41 fans voting for her. San E has 5 to 86 fans voting for him. In case some of those numbers don't make sense to someone. Only 77 MAMA poll votes were done by the Playgirlz Voter but 9 of those votes where make using MWave accounts that were not previously used for MAMA voting so they could only give 1 rose each to Raina(totals to 9 roses) however since the other the 68 votes were made using MWave accounts that were used for voting yesterday, they gave 2 roses to Raina each(totals to 136 roses) and that's why 145 roses were given to Raina instead of the expected 154. Also you would normally expect 6 fans to give 60 roses in total but 2 fans did 2 sets of votes within the MAMA voting day which is possible due to the fact that the MAMA poll and MAMA roses poll is out of sync with each other by 14 hours. i.e. 2 fans both voted on 2 "MAMA poll voting days", once between the times of 10:00 am to 11:59pm and then on the next day between the times of 12:00am to 9:59 am. 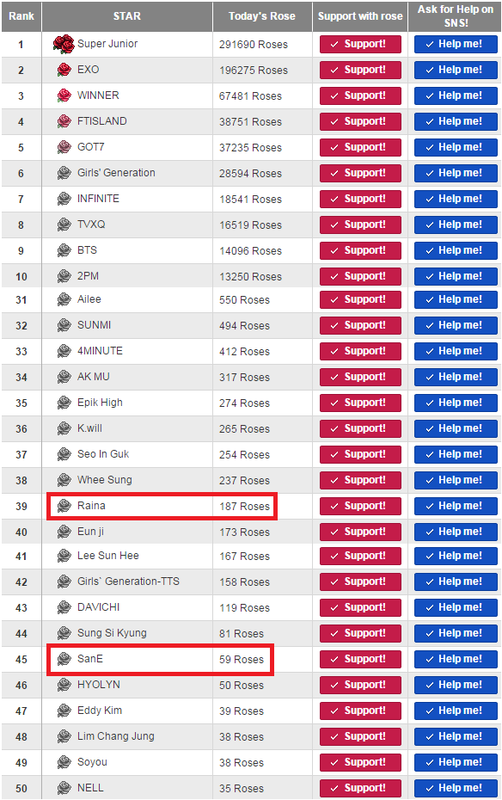 This is 2 different days in terms of MAMA poll voting but for the MAMA roses poll it's just 1 day. We need about 14585 fans running the Playgirlz Voter once a day(gaining 10 MAMA votes each day) to match what Super Junior fans have achieved. Do we have 14585 fans within this fandom?...I'm very sure we do. Guys, don't just help promote this campaign PARTICIPATE!!! 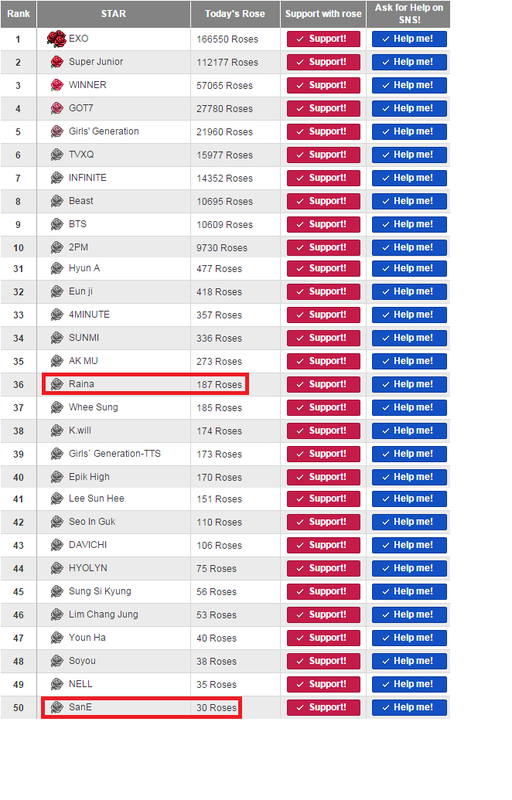 I've contacted over 20 different After School fan bases to help this project, only 3 responded and since starting this Roes for Raina campaign we've gotten only 3 new Playgirlz Voter user. 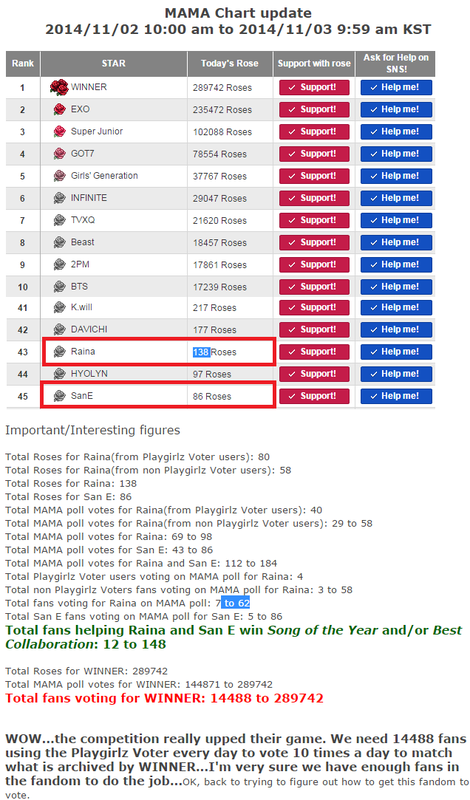 There's only 7 Playgirl Voter user right now that are regularly trying to help Raina but 5 of those user I know are not Raina bias fans....WHERE ARE YOU RAINA FANS? 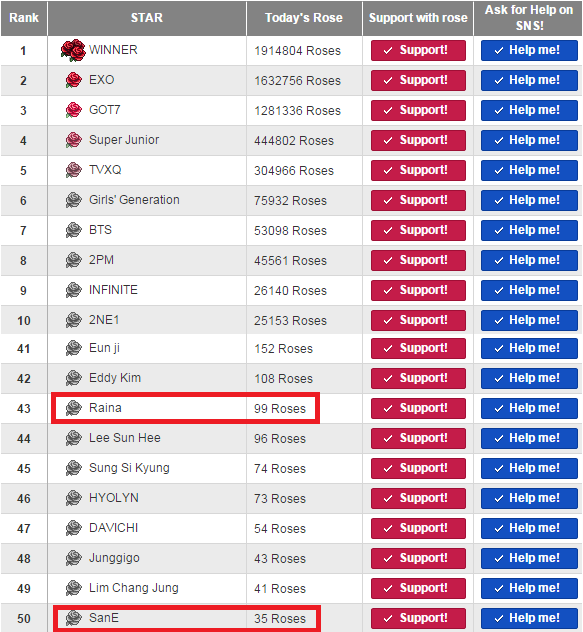 Even if Raina can't depend on the rest of the fandom to support her, SHE SHOULD BE ABLE TO DEPEND ON YOU! YOU LOVE HER ENOUGH TO BE HER FAN BUT NOT VOTE FOR HER? This is going to be the last update I do for about a week because I'll be on vacation tomorrow.